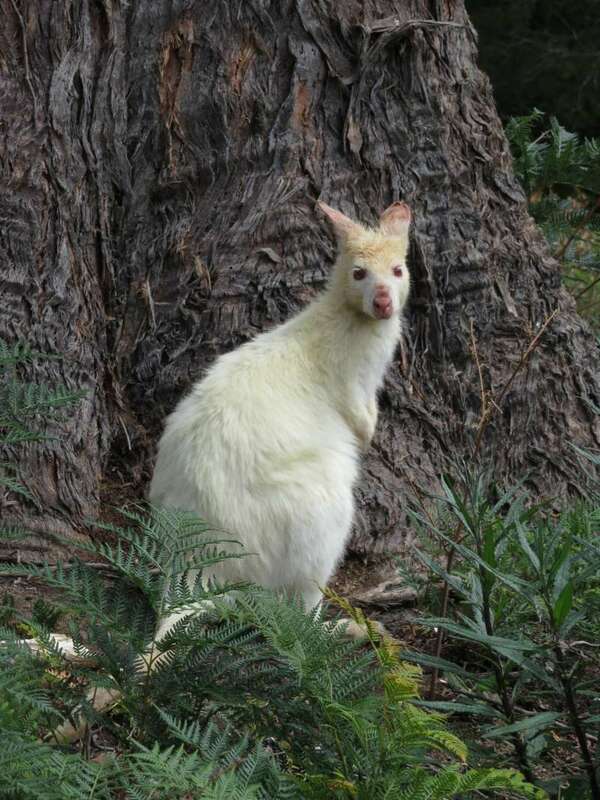 The Travelling Lindfields: The White Wallabies of Bruny Island. The wallabies live around the south side of Adventure Bay. We went looking for them at the Adventure Bay caravan park where I had read they are often seen. It was about 1 pm and like almost all Australian animals the white wallabies of Bruny Island are most active at dusk and dawn, so while I was confident we were in the right place I was prepared for yet another animal spotting disappointment. The caravan park wallabies were nowhere to be seen but not far past the park we turned down a dirt road (Lockleys Road) and about a half a kilometre along we saw our first white wallaby. 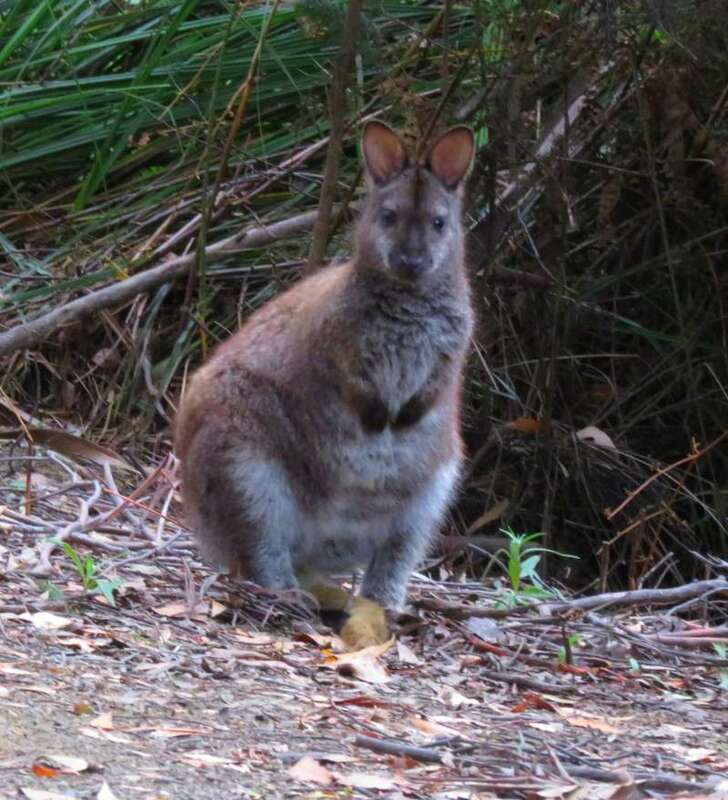 He and a second, dark brown, wallaby were sitting about 25 metres from the road on the edge of a paddock. A wire paddock fence stopped us from getting very close but he seemed as curious about us as we were of him. He stood and posed for the camera for fifteen minutes or so before bounding away. Another half a kilometre further along we found a second white wallaby. This time there was no fence and he let us walk within a metre or two of him. Like the first wallaby he seemed completely unafraid of us and posed happily for the camera. Bruny Island has a permanent population of 650 people. About 100 kms in length it consists of a north island and a south island connected by a spectacular spit of sand and dunes known as The Neck. There are no large towns. Apart from a few cafes and holiday accommodation there are very few facilities. North Bruny Island is mostly pasture and light bushland. This is where the ferry docks. South Bruny has large areas of rainforest and plenty of untouched wilderness in the South Bruny National Park. Bruny is a mecca for bushwalkers. From September to February each year Little Penguins (Fairy Penguins) come ashore along The Neck to breed. They are very timid and don't leave the water until dusk. David and I left Bruny long before the penguins were due to arrive, however judging by the number of burrows we saw, they must come ashore in significant numbers. The Neck which connects North and South Bruny Island. The stairs lead to a spectacular view. If you want to see the penguins you will have to stay overnight. The last ferry leaves Bruny at 7.15 pm and sunset is not until about 8.45 pm. You don't need a special tour to see them. There is a viewing platform at The Neck. You can't miss it - just look for the sign. This sign is right next to the road. The stairs lead to a penguin viewing platform above the beach. Apart from white and brown wallabies and penguins, Bruny has echidnas, possums and pademelons. David and I caught sight of a blonde echidna by the side of the road but by the time we were able to stop he had gone. We saw several brown wallabies not far from where we saw the white wallabies. Cape Bruny Lighthouse is at the far southern tip of the island. Like all lighthouses it is worth the drive, if only for the photo opportunity. David and I have seen endless lighthouses on our travels but we couldn't leave the island without adding Cape Bruny Lighthouse to our list. 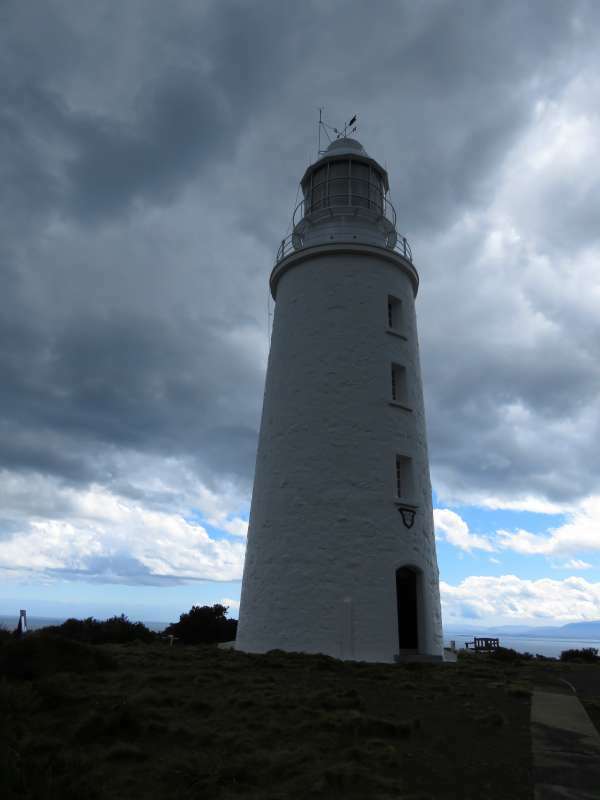 To reach cape Bruny Lighthouse you need to enter South Bruny National Park for which a fee applies. 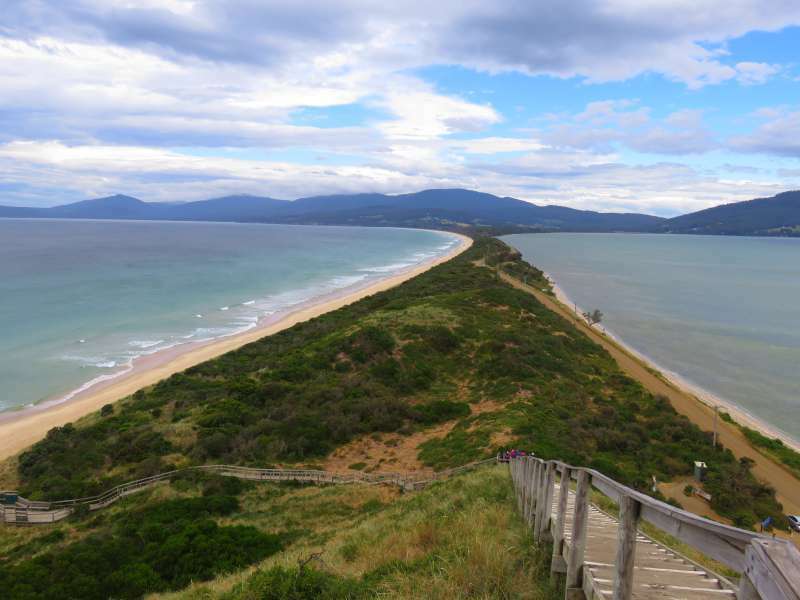 Access to Bruny Island is by car ferry from the small town of Kettering, about 33km south of Hobart. The ferries run every half hour in summer and take about 15 minutes. You can check the timetable - here. Note that the last ferry off the island leaves at 7.15 pm. The timetable varies according to the season so check before you go. The ferry costs $33 per car. The entrance fee to South Bruny National Park is not included in the ferry ticket. Only some of the island is within the National Park. You can see the white wallabies and the penguins without entering the park. Bruny Island is 100 km long so you will need a car. Fill up with petrol before you catch the ferry. There is a petrol station at Kettering. We were told there is a petrol station on the island at Alonnah but we didn't see it. To be fair, for once we were organised so we weren't actually looking for it. You can hire bicycles in Kettering but even though David and I are avid cyclists we decided the island was far too large to cycle around in a day. If you watched the Kettering Incident on T.V earlier this year you will be relieved, or perhaps disappointed, to hear that we didn't see a single alien either in Kettering or on Bruny! Port Arthur: A World Heritage Convict Site. 10 Australian animals you have never heard of, and where to find them. If you would like to follow our travels, enter your email address in the 'Never miss a post: Follow by email' box in the right hand sidebar just below our profile picture. If you found this post interesting, fun or useful please share if with friends, family or the world! Bruny Island is not well-known even in Australia and yet it is very easy to get to. Haha - they are wallabies, not rabbits. If you ever return to Australia, have a look at the post I did two weeks ago on The 17 Best Places to see Australian Animals in the Bush. I wrote it for people just like you. There are so many wild kangaroos in Australia, I have seen thousands of them but you have to know where to look. 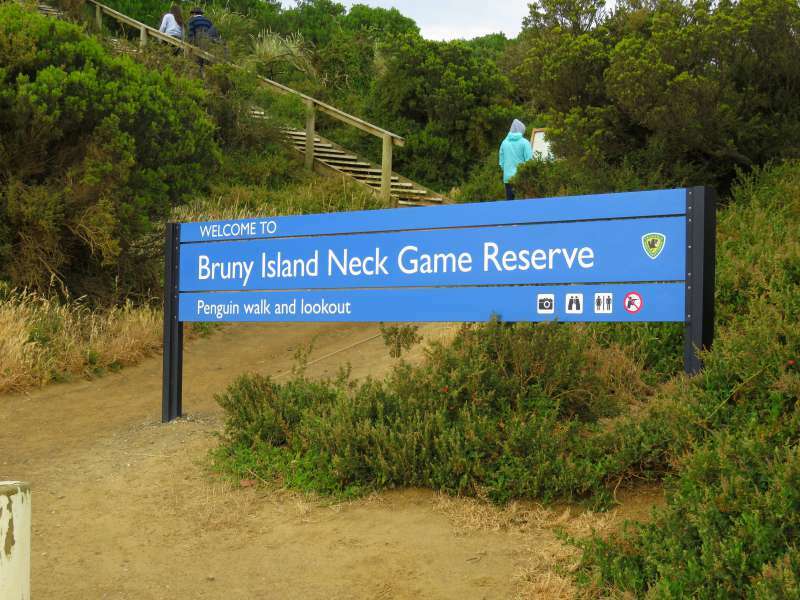 While I may have seen it on a map, I never knew about Bruny Island. How fantastic that you were able to spot some white wallabies! Wildlife sporting can be a game of chance, so glad you succeeded. It helps to know where to look. We would have maximised our chances by staying overnight on the island and being able to look for them around dusk. Given that we didn't do that I'm glad we got lucky. I am already planning a return trip in 2018 so we can stay on the island. David isn't into wildlife at all but he is happy to indulge my passion for it - most of the time! Wow, what a cool find. And lucky for David that you are a wildlife person :) Those white wallabies are really fascinating, and beautiful in their own way. I am so glad your luck changed. I am adding Bruny island (which I misread as Bunny Island when I linked to the post) to my bucket list. We still haven't made it to Tasmania, but now we need an extra night when we do go. Thanks for the tips at the bottom, they will come in handy. If you plan a trip let me know and I will give you a recommendation for accommodation. While we didn't stay on Bruny we did see one place which looked quite okay and it was at Adventure Bay. Wallabies are often mistaken for kangaroos. They are very similar, except that wallabies are usually smaller. They are quite closely related. I remember reading your Alaskan posts and your disappointment at not seeing more animals - at least I wasn't the only one who didn't see the animals I expected. Lyn, You always find the coolest places to go. This one is definitely going on the Australia list! I love a car ferry! Boy, those little guys are cute! David and I once lived on Norfolk Island. Look for the middle of nowhere and you will find it. It gave us a life-long interest in islands and now we seek them out whenever we can. There are some great car ferries in Australia. You can even get to Tasmania on one. Lyn I didn't even know about the white beauties. You managed to get some incredible photos! We didn't get to Bruny when we went to Tasmania. Looks like we may need to go back! I have never been a great fan of Tasmania, much to the distress of my Tasmanian friends, however I am now officially a convert. Tasmania is my absolute favourite destination. Not only did we see the white wallabies on Bruny Island (we are already planning a return trip by the way) but today we stood and watched a playpus play in a river at Deloraine. It was utterly magical. Not sure if my previous comment posted since I was doing it on my phone... Are these white wallabies their own separate subspecies? We saw an albino kangaroo at a sanctuary on Kangaroo Island. When it had its head down, it looked like a giant rat. Bruny Island looks nice, especially that lighthouse. Hi Michele, Thanks for your persistance, your earlier comment didn't come through. The reason I didn't mention why the wallabies are white is that when I did some research on the internet I got a few conflicting theories. However I think the explanation is that the wallabies are Bennetts Wallabies which are a separate subspecies but Bennetts Wallabies are usually brown. The white wallabies are albinos which have interbred so that the recessive characteristic has become common. What adorable wallabies! Australian wildlife just keeps getting better and better. I love reading your blog for this! Thank you for the kind words. I thought they were pretty cute too. 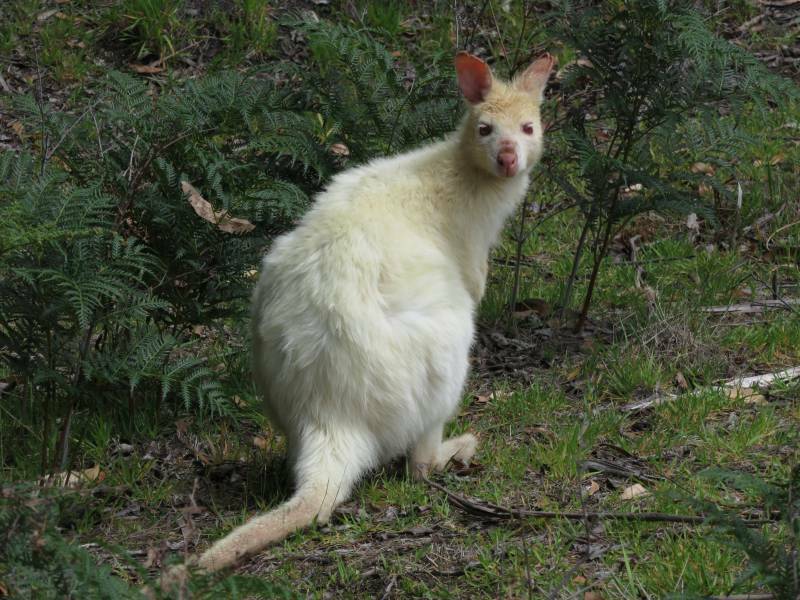 Oh my god Bruny Island white wallabies, I had no idea this existed, they're so cute!! I hadn't heard of them either until I started reading about Bruny Island. White wallabies! So cute. Would love to explore this game reserve. Thx for sharing your xperience with us. Although there are National Parks on Bruny Island and we were close to one when we saw the wallabies we weren't actually in one. The wallabies roam all round the streets here. I love the view from The Neck and those wallabies are so cute! What a shame you didn't see whales in Alaska, but hopefully this made up for it. Would have been neat to stay overnight and see the penguins and to go biking as I know you and David like biking so much! We are thinking about going back in a year or so and staying for a few nights to see the penguins. Tonight we have a penguin tour booked at Low Head in northern Tasmania so all is not lost - lol. 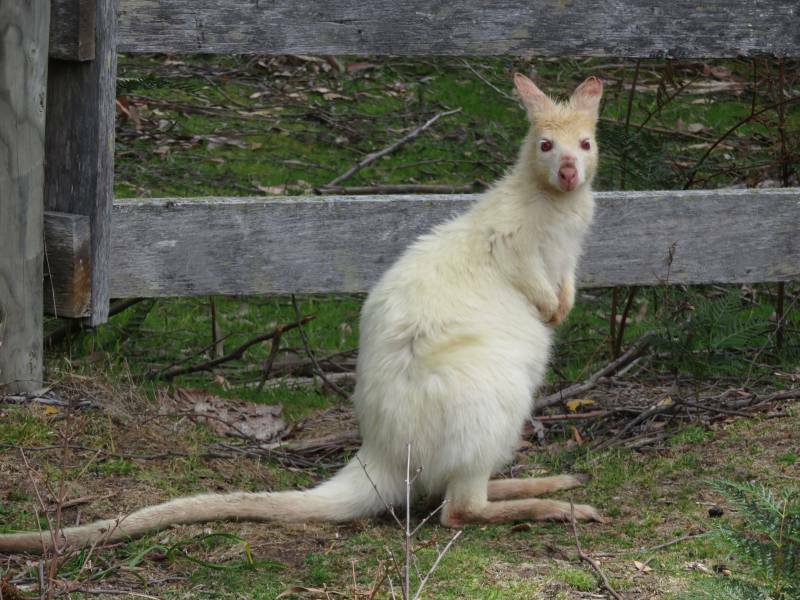 Those white wallabies are beautiful! Just one more reason why I'd like to go to Tasmania. Tasmania is great if you like animals, wilderness and history. Tasmania has been on my mind and this just makes me want to visit even more. So cool. You should do it. David and I have loved it so much we are planning to return in a year or so - of course it is easy for us because we only live a couple of hours away by air. They were about the size of other wallabies but much smaller than most kangaroos. They are just so sweet! I am so glad that your little adventure was successful. Bruny Island sounds like a place I would like to go. Bruny is just magical. Beautiful scenery and lots of wildlife. It is only half an hour from Hobart too which made it easy to get to. We have never been to Bruny Island, and come to think of it, we have never been to Tasmania either. I guess that the penguins of Phillips Island are the closest we came to seeing the white wallabies of Bruny. But we are reading your wonderful articles, taking notes, and who knows ... there might be some white wallabies in our future. Thanks for a wonderful article! Haha - I am glad you are taking notes! The penguins on Phillip Island are fantastic - definitely one of my favourite wildlife experiences but I was sorry to miss seeing them on Bruny. We are planning a return trip to fix that. In a couple of weeks I will put up my post on the penguins of Low Head, near Launceston. Thank you. That is worth knowing. Absolutely fabulous. We didn't find the roads too bad but then we used to live on Norfolk Island, you should see the roads there - lol! Haha - I never thought about the blond thing. Maybe there is something in the air down there. 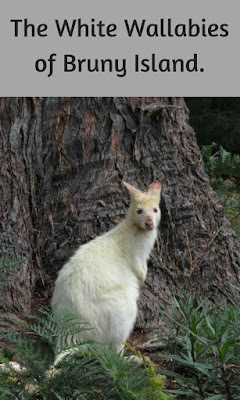 I was there in November last year, and had no idea that there was such a thing as the Bruny Island albino wallabies! Granted, I was there for the oysters...a great reason to get back! Next time, you search out the wallabies and I will try the oysters. I never knew there were White Wallabies. Looks like yet another destination to add to a growing list. I only found out about them a day or so before we saw them. I was lucky enough to come across a travel blog which talked about them.